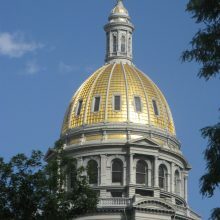 The Colorado State Capitol Building was built in 1898, modeled after the United States Capitol. 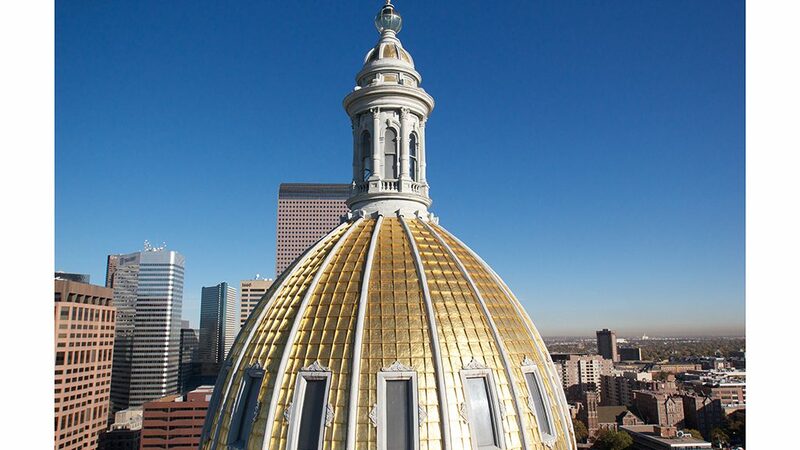 Its dome is gilded in genuine 24k gold to commemorate Colorado’s 1859 Gold Rush. 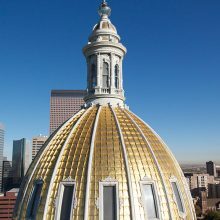 The dome has been re-gilded a total of four times over the years. EverGreene has had the privilege of restoring the gilded surface twice; first in the early 1990s as part of an extensive restoration after the dome was damaged by hail, and again in 2013, when an 11,000 square foot dome made of entirely new copper was installed as part of a seismic stabilization and interior restoration upgrade. For this unique project, EverGreene sourced gold mined in Colorado for the dome. The raw gold, processed and donated by AngloGold Ashanti Mining Company, was sent to Florence, Italy to be melted and pounded into gold leaf sheets by classical masters, then shipped back to Colorado for application. EverGreene prepared the surface of the dome by first stripping, acid washing, and priming the copper substrate surface. 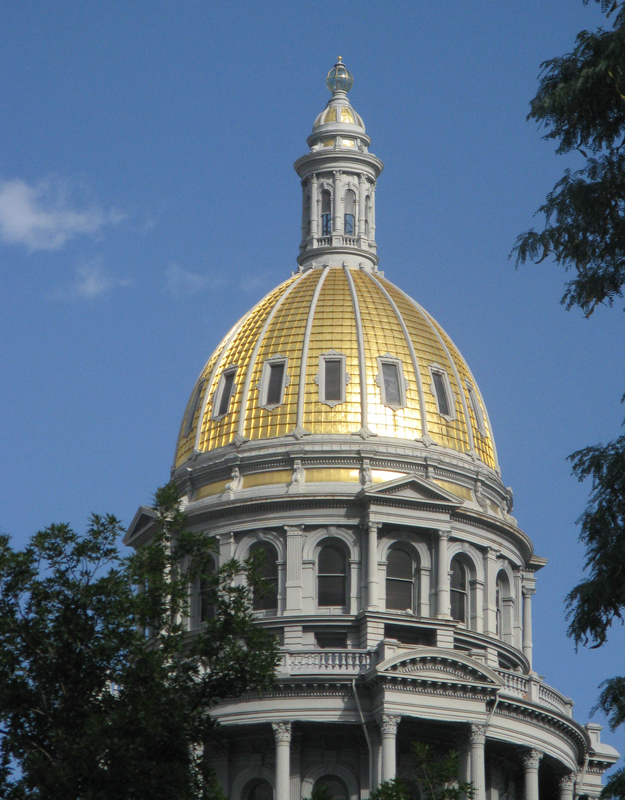 Then in July 2014, our Conservators repelled down the state capitol to cover the dome’s surface with the new gold. The Capitol’s two-phase interior portion of the project resulted in the complete restoration of the House and Senate chambers. Phase I, completed in the summer 2014, included conserving the historic stenciling on the lower walls, installing acoustic plaster panels at the gallery walls and replicating the historic stenciling on those panels. The scope also scope called for the gilding of plaster ornament as well as decorative and flat painting. EverGreene completed the second phase in the summer 2015 after installing acoustic plaster on the ceilings, replicating historic stenciling, reinstating ornamental plaster and applying gold leaf, decorative and flat paint. One highlight of the project was conserving and replicating the historic stenciling, originally applied with distemper paint, on the metal ornamental skylight. The House Chamber was finished in a green palette and the Senate Chamber in red.